We had been watching the weather for the past few days and could see a northern front moving in. These fronts happen frequently during the winter months and tend to settle over the islands for a few days of wind and rain before moving on. Luckily, we had plenty of time and my parents knew of the perfect little harbour to wait out a winter storm. 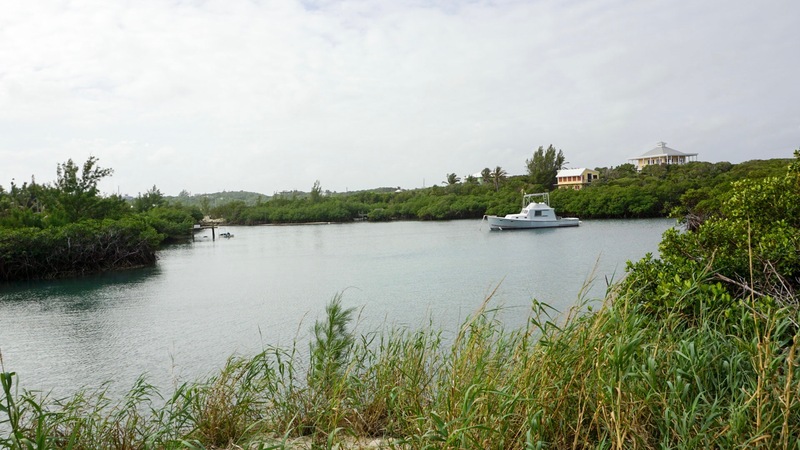 Little Harbour is a small community nestled into central Great Abaco Island. Although well protected from the weather, it also has convenient access to the Atlantic Ocean and makes a great jumping off point for a crossing to Eluthera. We were not the only people with plans to wait out the weather in Little Harbour. There was only one mooring ball left when we arrived! My parents gave Brandon the helm so that he could get some practice navigating the crowded shallow harbour and hooking a mooring ball. This wasn’t his first time driving the boat or hooking a mooring ball and things were going really well . . . right up until we heard a man screaming at us to STOP! We had driven too close to his mooring line and snagged it. The two boats were drifting right into one another! Brandon shut off the engines while my dad and I scrambled to put out extra fenders before the two boats collided. Once both boats were safely stopped, though only separated by our fenders, we were able to evaluate the situation. It was a tangle of lines, one of which was wrapped around our prop. We were clearly the spectacle of the afternoon. Half the boaters in the harbour were now out on their decks watching our embarrassing debacle. A neighboring boater even took pity on us and came over in his dingy to help out. It took both my dad and Brandon in the water with snorkel gear to eventually untangle the lines and free the boats from one another. It was definitely not our smoothest landing but luckily no one was hurt and the only thing damaged was our pride. All that was left to do was head to the bar and buy a round of drinks for the guys on the other boat and our friendly Canadian neighbors who rushed over to help. Thankfully, no one gave us too hard of a time for our rookie mistake. They had all done something equally embarrassing at one time or another. 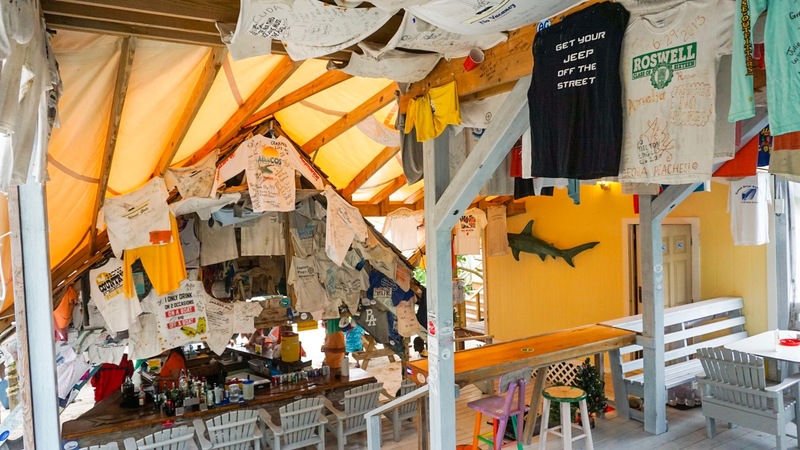 There are only two businesses in Little Harbour: Pete’s Pub and Pete’s Gallery. That’s right, one guy basically owns and runs the entire community. And it’s been that way since the very beginning. 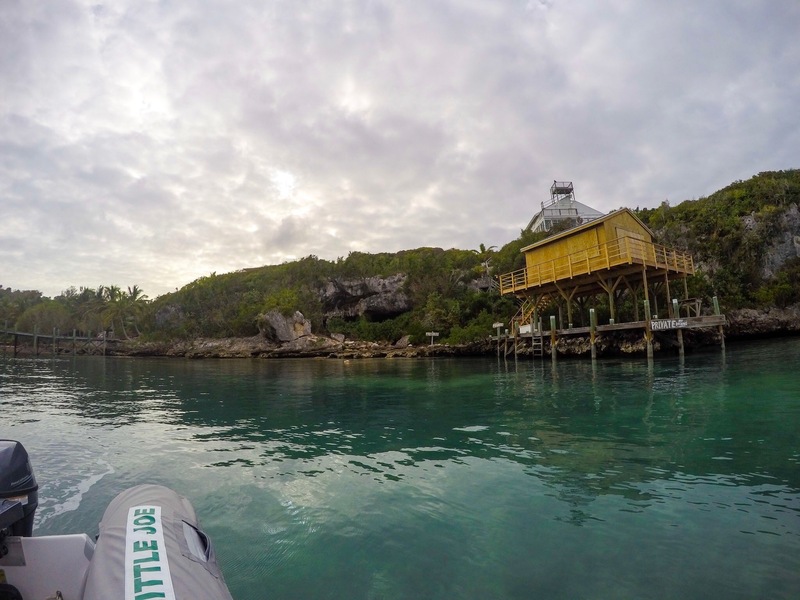 Little Harbour is the real life result of one man and his family doing what many joke about but never actually attempt—leaving it all behind and building a new life in paradise, Swiss Family Robinson style. Randolph Johnston arrived in Little Harbour by boat in 1952. Back then, boat was the only way to get to Little Harbour. The first access road wasn’t built until the 1980s. With him, Randolph brough his wife Margot and their children, Denny, Pete, Bill, and Marina. Randolph had been a university professor at Smith College in Massachusetts but dreamed of a life devoted to his art, a dream that seemed quite impossible with a mortgage to pay and little mouths to feed. 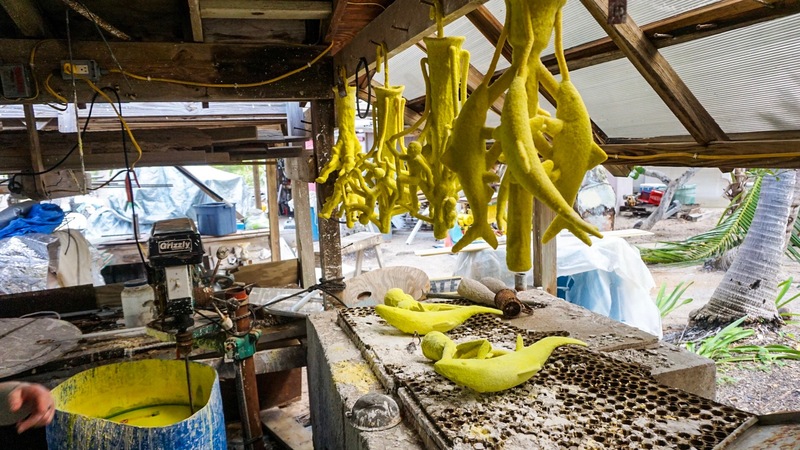 I’m not sure what sparked the idea of selling everything and homesteading in the Bahamas but the planned worked. Most people would have just moved somewhere cheaper than Massachusetts. But in the Bahamas at that time, they didn’t even have to buy the land. Little Harbour was completely uninhabited and owned by no one. The Johnston family simply moved in and built their home and art studio. 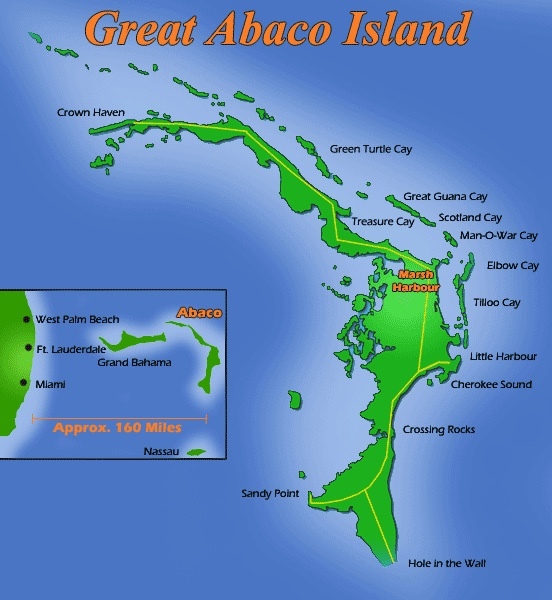 They were eventually granted ownership of the land by the Bahamian government. It sounds idyllic but it must have been painstaking work. They had no electricity or running water. They relied on candlelight and rainwater collection. All supplies had to be brought in by boat. Supposedly, when it rained everyone would run to grab the soap because that was their only chance for a fresh water shower. Little Harbour is still dependent on generators and rainwater collection, but the system has been significantly modernized in recent years. Peter Johnston (one of Randolph’s four children) inherited Little Harbour from his parents and now manages the growing community. Much of the property has been sold off to build vacation homes, dramatically changing the look and feel of the Harbour. 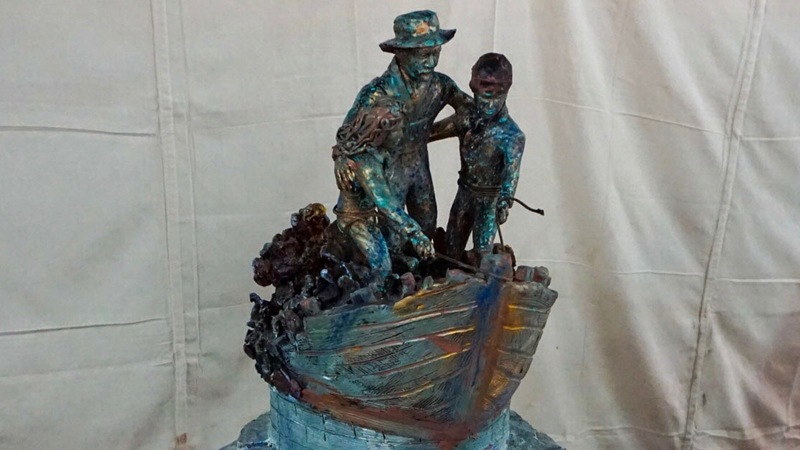 Like his father, Pete is an artist specializing in bronze sculpture. He continues to work and produce art at the foundry built by his father. His work is on display in the nearby gallery. Some pieces are enormous and priced in the five-figure range. He seems to find inspiration from the local sea life. Sting rays and sea turtles are a frequent theme. Keep reading for the tour of Pete’s Foundry later on in this post! 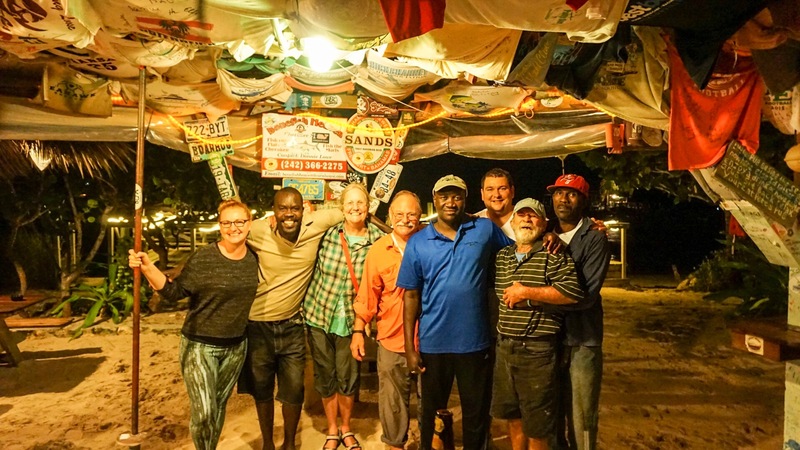 After the government built a road from Marsh Harbour to Little Harbour in the 1980s, Pete opened Pete’s Pub, which has been a hit with locals and boaters ever since. The drinks are strong, the food delicious, and the staff will make you feel like they have known you for years. It was also a perfect place to watch the storm roll in. We spent a lot of time at Pete’s Pub over the next few days. The place is nothing fancy and that’s exactly how it should be. The floor is sand. The seating is area is just a bunch of old picnic tables. And the whole place appears to be held together with bubblegum and ducktape. Or maybe it’s held together by all of the stickers and t-shirts stapled to any available surface. The entertainment is simple. No TV. No Wifi. But you can pass hours trying to learn how to throw this rope on a string “just right” so that it catches the hook on the wall. By the time we left we were learning how to throw the ring using only our heads! The best part of Pete’s Pub is the people. The place is full of interesting and friendly characters. We were there during the off-season, which is a downside for many folks, but we really enjoyed the lack of crowds because it gave us a chance to make friends with the locals. Our second night in Little Harbour we stopped by Pete’s for an afternoon pick-me-up and didn’t leave until closing time (which is only 9pm). When the rain came roaring through we decided it was best to just stay put rather than get soaked by the storm. Before we knew it, they were writing the dinner menu up on the blackboard! The lobster fettucine was so good that we just couldn’t leave! Ok ok, maybe that was the rum drinks and not the fettucine talking. By the time we left we were the only tourists left in the bar, but we no longer felt like tourists. Mom was chatting with the bartender (who, like my mom, was also a school teacher), Brandon and I were learning the ring toss game from some local guys, and dad had befriended a local fisherman named Charlie. Because we were the only people left at the bar, they let us beach the dingy on the soft sand rather than walk all the way back to the dingy dock. That was probably a good call too. I suspect a few of us might have had too many rum drinks to climb down the dock ladder safely. 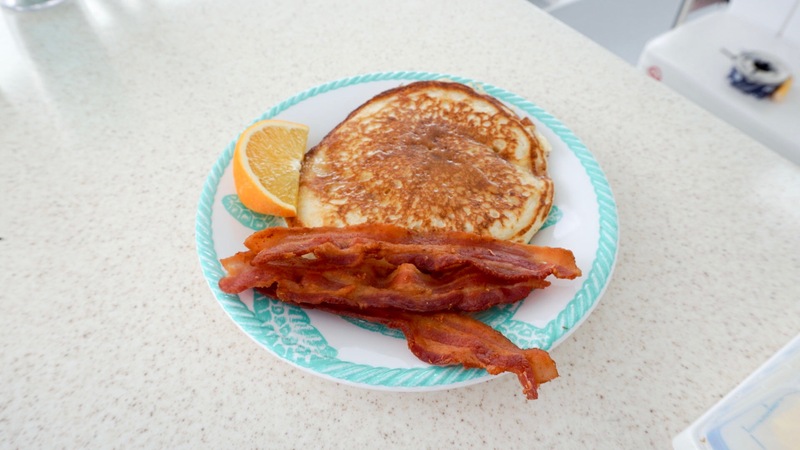 When pancakes and bacon won’t cure your hangover the only thing left to try is the hair of the dog that bit you. Well, technically, we came back to the bar to staple a shirt to the bar rafters but we couldn’t leave without a rum punch. For years Pete has been letting bar patrons staple shirts wherever they please. People sign their shirt and hope that it will still be there when they manage to return a few years later. 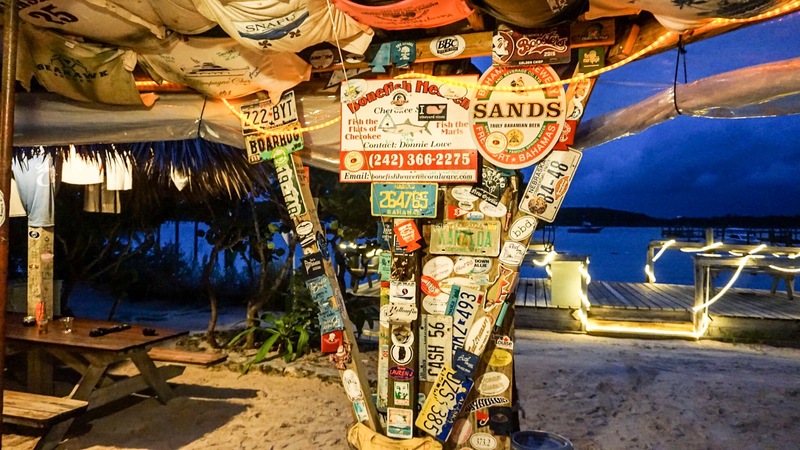 The bar staff leaves them up as long as possible but nothing lasts forever in the salty ocean air. We both added our names to the Maine Cat Catamarans T-Shirt my parents hung up few years ago and added our own Jeep Nation T-Shirt. We couldn’t bring our Jeep to the islands so this was the next best thing! 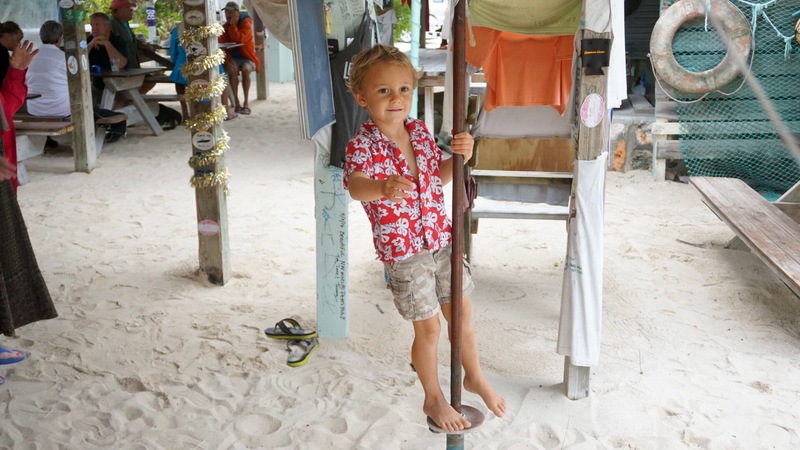 This little guy is Fletcher, Pete’s grandson. Fletcher is basically the local ladies man. He charms all the girls at his grandpa’s bar, grabbing them by the hand and convincing them to play whatever game he comes up with. The night before, Fletcher and I played “pancake baker”, which involved using some buckets and our flip-flops to make pancakes out of sand. 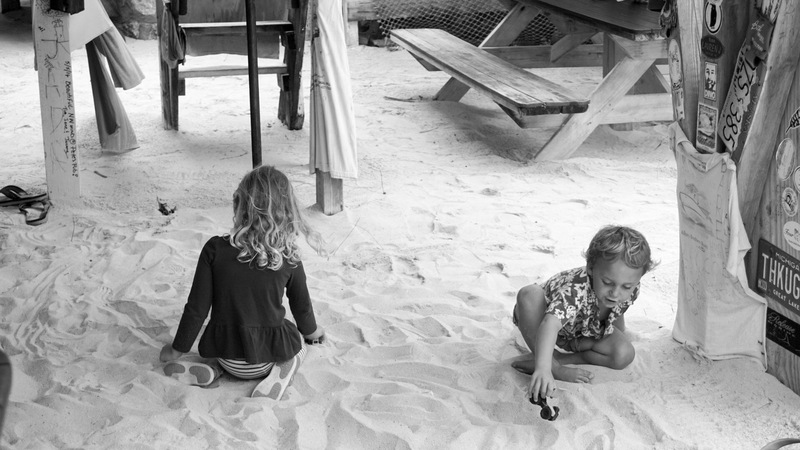 While the pancakes were baking in the “oven” (i.e., under the picnic table) we ran in circles around the bar. This kid is adorable. The following day we decided that we should explore what Little Harbour had to offer beyond hanging out at Pete’s Pub. 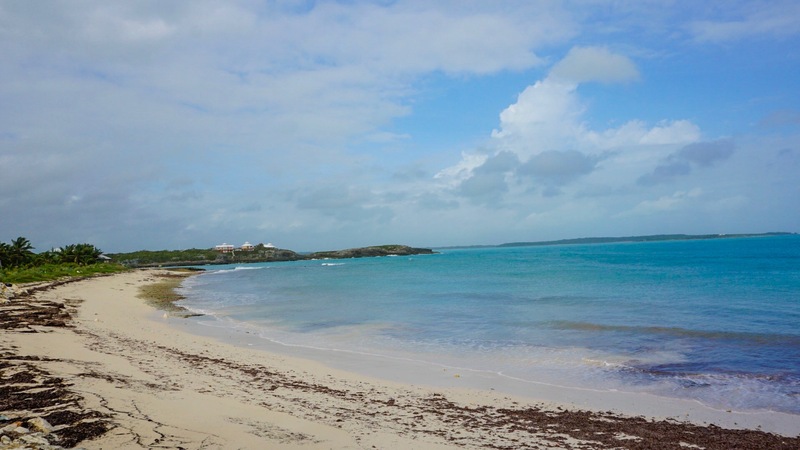 First, we walked to over to the Atlantic side of the island to see the beach. We never checked it out ourselves, but we were told that this is actually a great snorkeling spot. There is supposedly a reef just beyond the beach, close enough to swim but also easily accessed by dingy. 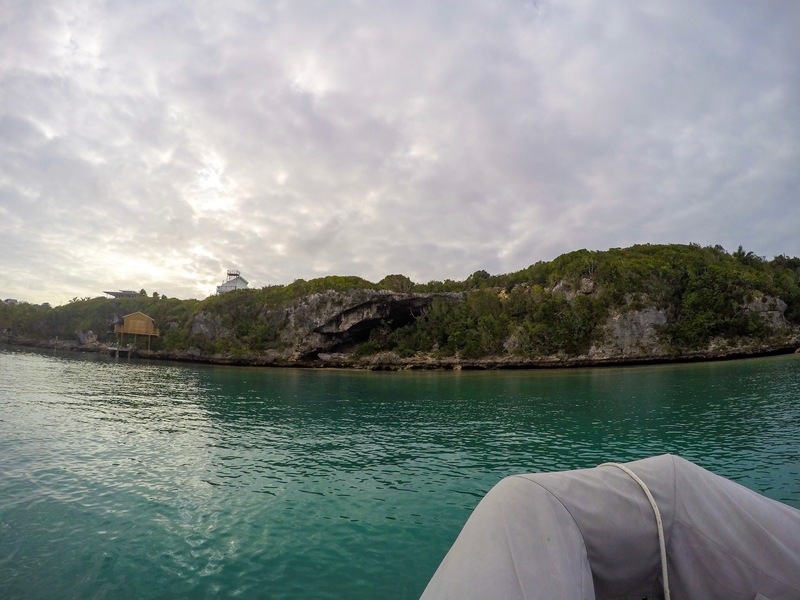 This little cove is connected to the main harbour but not used by visiting boaters because there are not any public mooring balls. 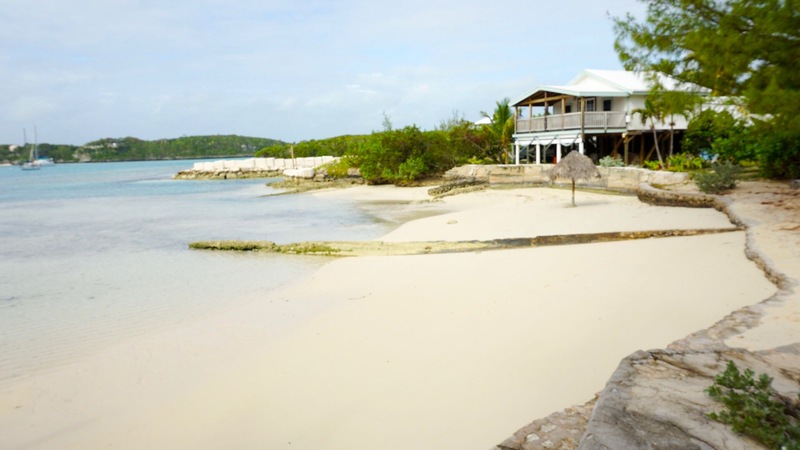 One of the features that first attracted the Johnston Family to Little Harbour was the perfect crescent beach. The beach was a great place for swimming and its well protected location made it a great place to build docks, their home, and the foundry. The dock below serves as the public dingy dock as well as the location of Pete’s private “yacht club”. I was never able to get a straight answer as to how one might become a member of the yacht club. I think the reality is that the club is just a hangout spot for Pete and his friends. 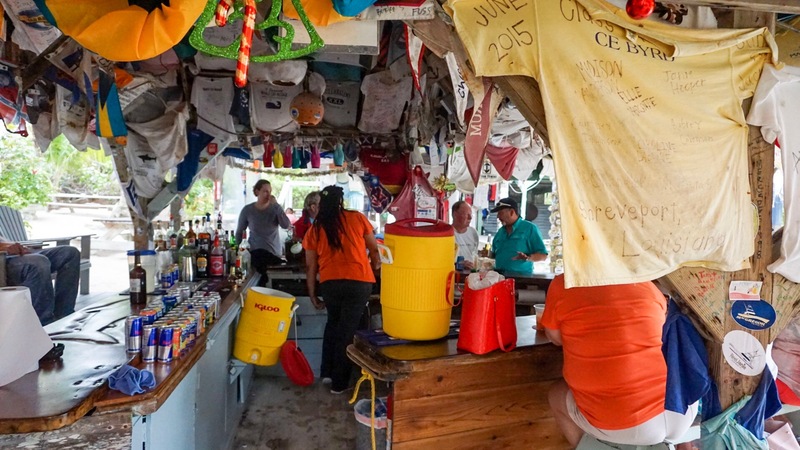 Most mornings you can find Charlie the fisherman here with his dog Poppet, mixing up a big batch of conch salad to share with bar patrons at the pub. We had a 10 am appointment to tour Pete’s foundry with a guy named Desmond. We were later told that they don’t usually give foundry tours, but Pete had invited us and Desmond offered to serve as tour guide (Desmond is the Pub bartender by night and works at the foundry by day). 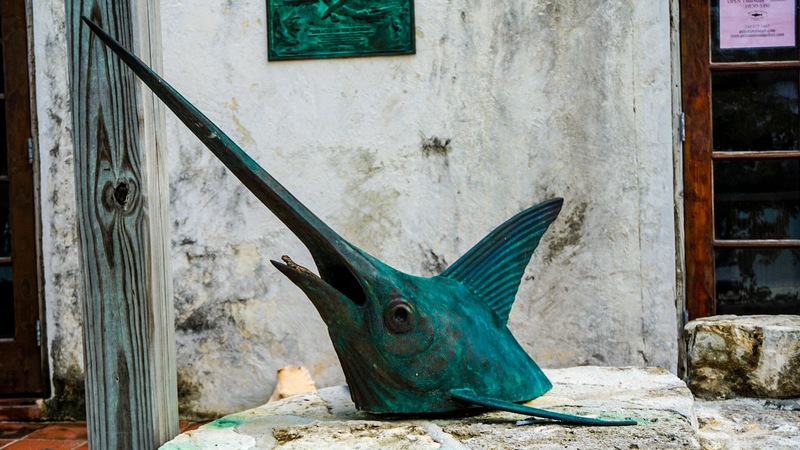 You can see Pete’s bronze sculptures all over Little Harbour. 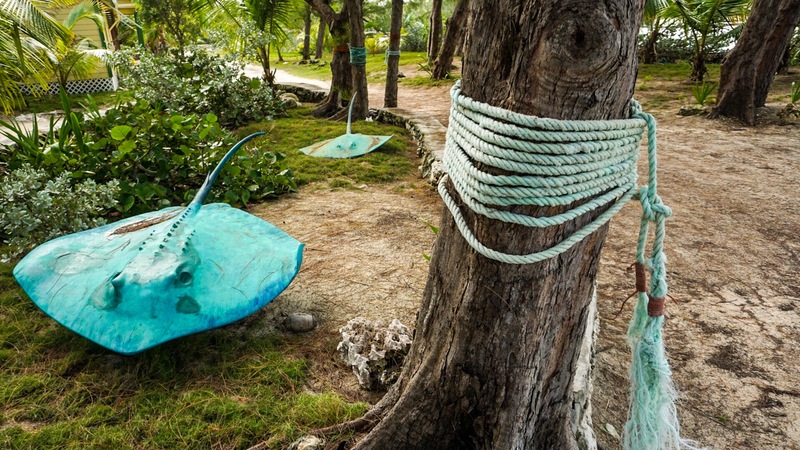 This pair of sting rays greet visitors arriving from the dingy dock. 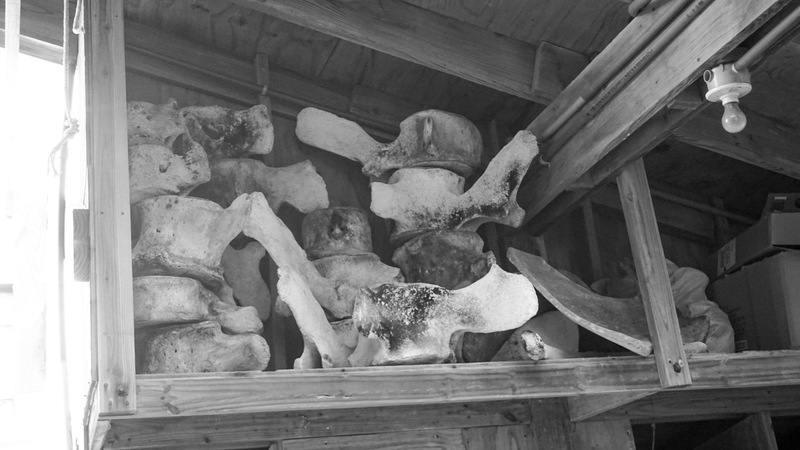 These are actual whale bones. A dead whale washed up on the beach a few years back so the guys at the foundry salvaged what they could from the skeleton. The beginnings of a future art project. 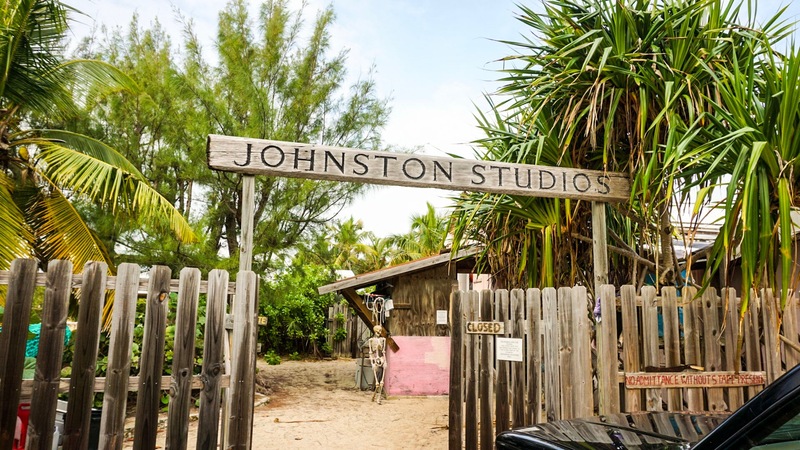 Welcome to the behind the scenes tour of Johnston Studios! This is what happens to mutinous employees at Johnston Studios. Not really. All of the foundry staff actually seemed really happy to work there. Our tour guide Desmond has worked at the foundry for a number of years and was incredibly knowledgable about the process of bringing Pete’s bronze sculptures to life. Johnston Studios specializes in a process called “lost wax” casting, a process that has been used since the early dynasties of Egypt, nearly 7,000 years ago. During a lost wax casting, the sculptor uses wax to create a mold of his sculpture. 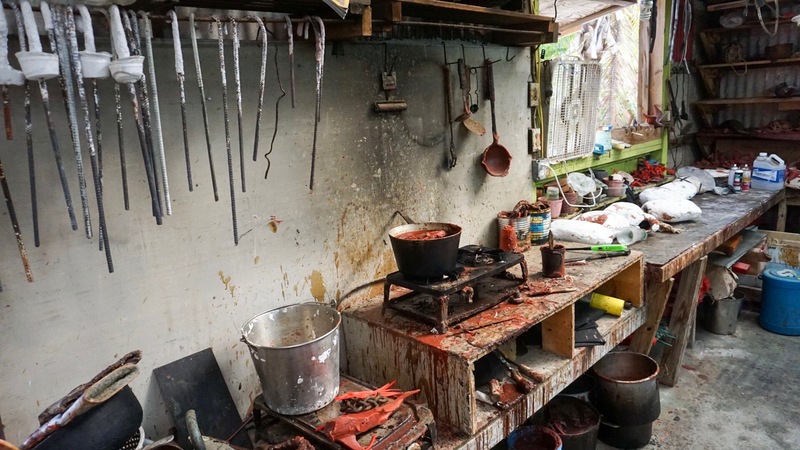 Before the bronze or other metal can be poured into the mold, the wax must be melted away from the inside of the mold, hence the term “lost wax”. This process involves a number of different steps. Foundry employees help out with the latter stages of the process, but the first step, the creation of the initial sculpture, is all Pete. Pete meticulously sculpts his originals from clay, using various paints and dyes to add details. The application of color does not come through in the finished bronze but helps the artist to see the small details of their work. 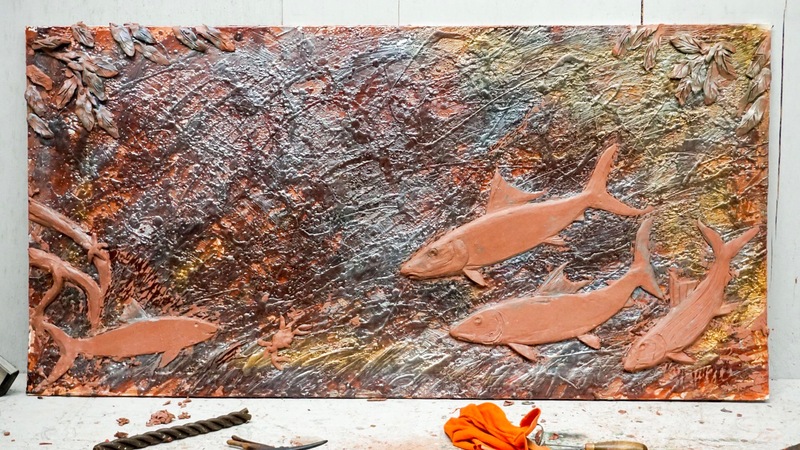 Pete has created numerous versions of a piece he calls Old Man and The Sea. The original sculpture is a three-dimensional representation of the classic story. The version below was commissioned by an art collector who wanted a piece he could hang on the wall. The clay original must be absolutely perfect because any mistakes, imperfections, or unintended texture will come through in the finished bronze. Once Pete is satisfied with his work, a mold can be made of the original. The molds are made from a flexible rubber that is carefully painted onto the surface of the original. Once the rubber is set it can be peeled away from the clay. In essence, the lost wax process involves going back and forth between positive and negative versions of the sculpture. The clay original is a positive and the rubber mold is the first negative. The rubber mold is often removed in sections which are then reattached to form the vessel for the next material — hot wax. Hot wax fills the rubber mold, recreating the exact details of the clay original. Once cooled, the rubber mold can be peeled away, revealing the second positive version of the original. Any imperfections in the wax version are fixed in a step called “wax chasing”. These might be air bubbles, seams, or lines created by the mold. Employees complete many of these steps, but the original artist is generally the one to fix imperfections in the wax. Any mistakes left in the wax after this step will show up in the final product, so this is the artist’s last chance to make changes to the piece. Next, the wax sculpture is used to create yet another negative mold. A network of wax tubes called sprues or gates are attached to the wax model. 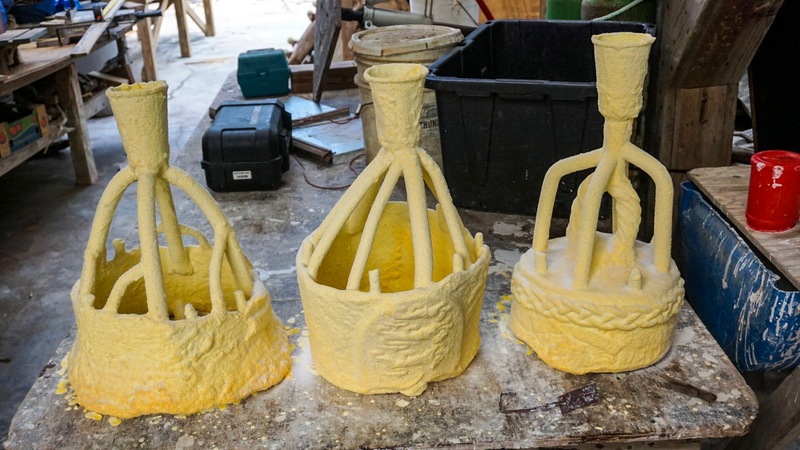 These will serve as channels to funnel the molten bronze into all the nooks and crannies during the casting process. The sprued wax model is then dipped into a mixture called “slurry” that creates a hard shell surrounding the wax. It can take seven to nine dips into the slurry mixture to create a thick enough shell. 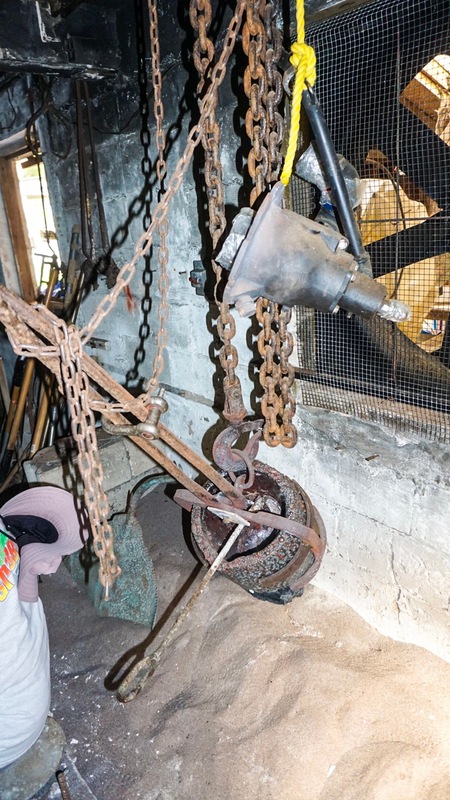 The pieces shown below will form a bronze bell when the final pieces are welded together. This final mold is called an investment mold, possibly because of the investment of effort put into its creation. Each one of these molds is one-time use. 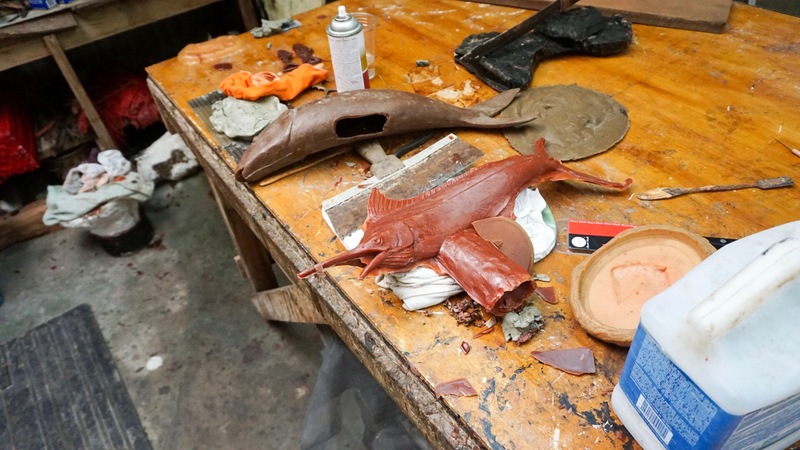 If a mold is broken or damaged, the artist must start over and create a new wax model from the preserved rubber mold. Once the investment mold is dry it can be “dewaxed”. During the dewaxing process the mold is placed inside a sealed high-pressure oven called an autoclave. Temperatures ranging from 1500 to 1800 degrees farenheit, along with increased pressure, melt the wax inside the mold and force it out. Although this step is where the term “lost wax” originates, the wax is not really lost. Foundry workers collect the wax that runs out the bottom of the oven and save it for use in future wax models. With the mold emptied of wax, and sufficiently hardened by the hot oven, it is ready for the final casting. The molten bronze mixture is prepared in a crucible, just as it has been for thousands of years. The heated molds are placed on a bed of sand to hold them steady while the molten bronze is poured into the mold. 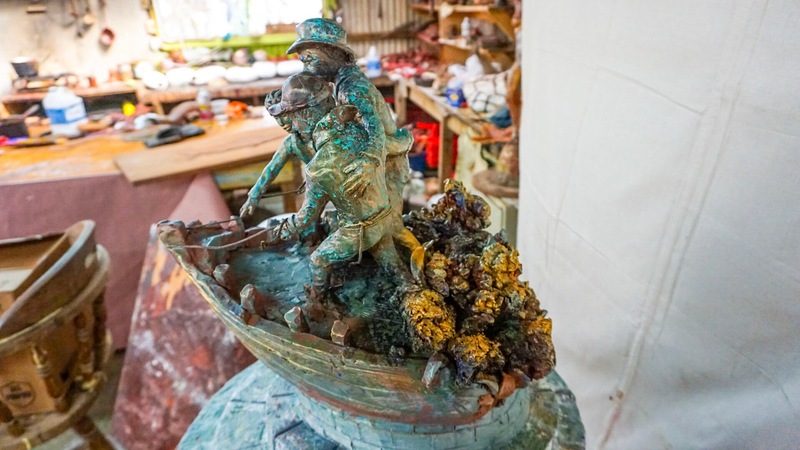 Once the bronze has cooled, the mold can be broken away from the finished sculpture. Although this is the final stage of the casting process, each piece will go through numerous finishing processes before being considered a final product. Large pieces cast in multiple sections (like the three-piece bell shown above) will need to be welded into one piece. The finished sculpture will then be sandblasted to create a smooth and shiny surface. 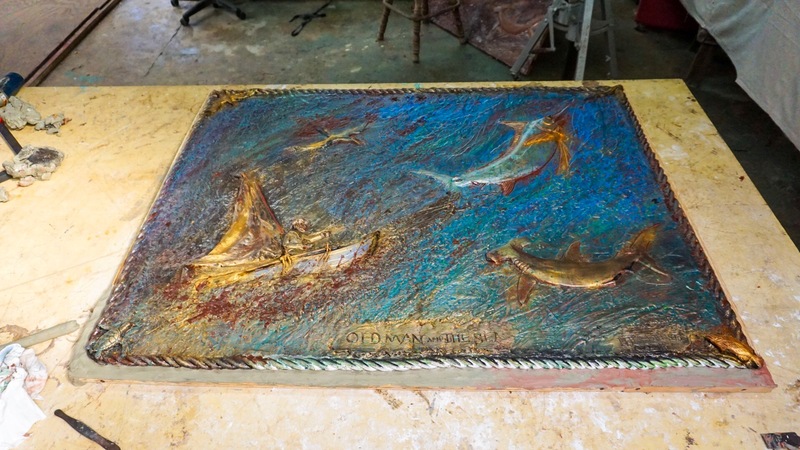 The very final step is the application of patinas, which give the bronze pieces their signature vibrant colors. Various chemicals and acidic substances are applied to oxidize the metal, creating reds, greens, blues, golds, etc. 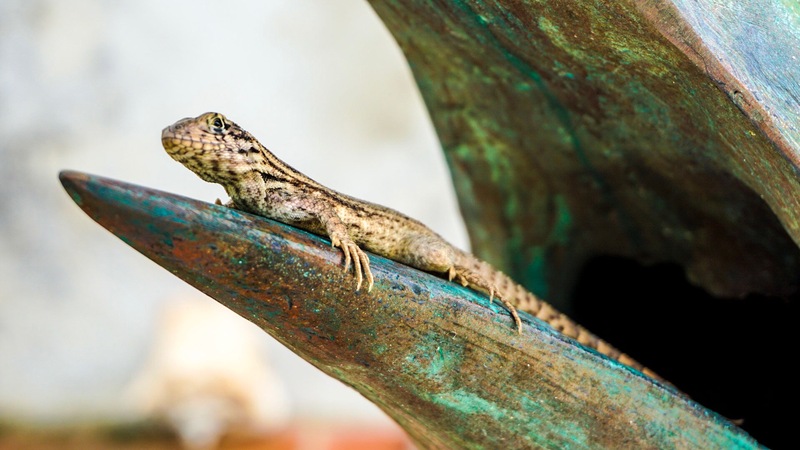 Although Pete’s sculptures are created as art, this piece has also become home to a tiny lizard! 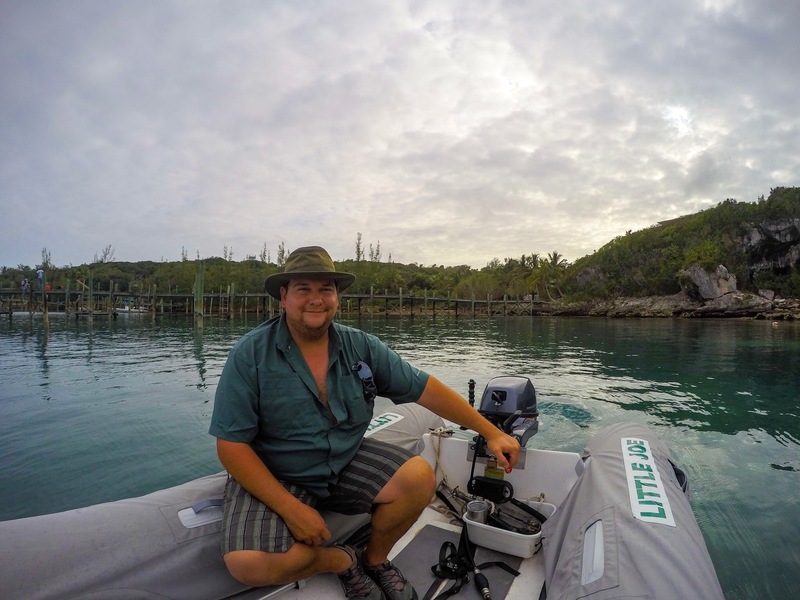 Later that afternoon Brandon and I went on a dingy tour of Little Harbour. We were hoping to find some of the many sting rays and sea turtles that supposedly reside here. We didn’t have much luck communing with the sea life, but we had a great time exploring the Little Harbour caves! 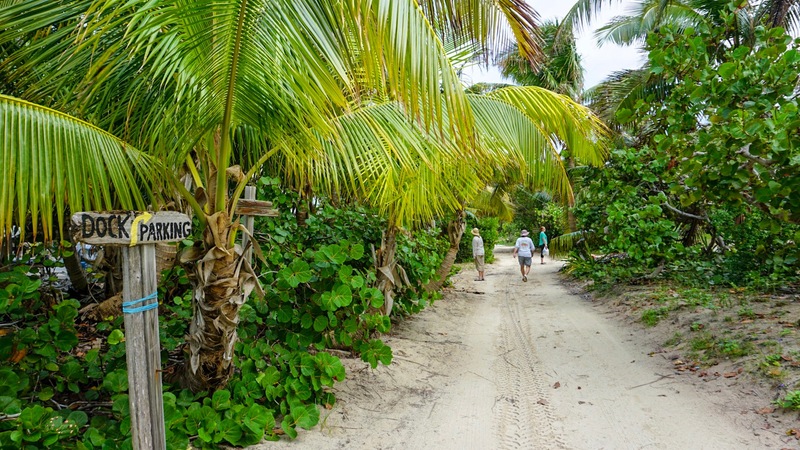 When the Johnston Family first arrived here they were essentially just camping on the beach. They had few permanent structures and definitely nothing substantial enough to withstand a hurricane. The family survived their first few hurricanes by seeking shelter in this nearby cave. The cave is not very deep, and covered in sharp limestone, so it probably wasn’t the most comfortable of quarters, but when caught in a hurricane without shelter you do whatever is necessary. 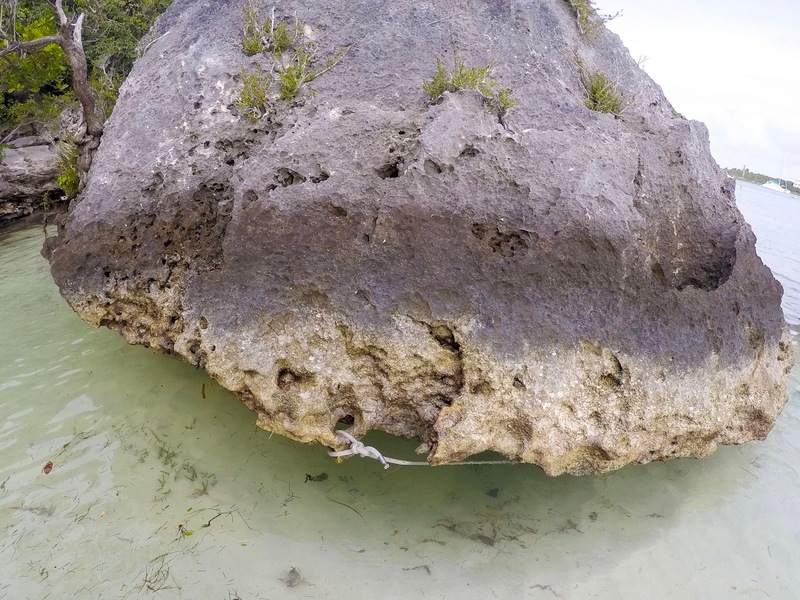 It’s like this rock was made for tying up your dingy! Also, I’m finally starting to get the hang of tying a bowline! It’s a basic but necessary sailors knot that I seem to forget and relearn every time I get on a boat. 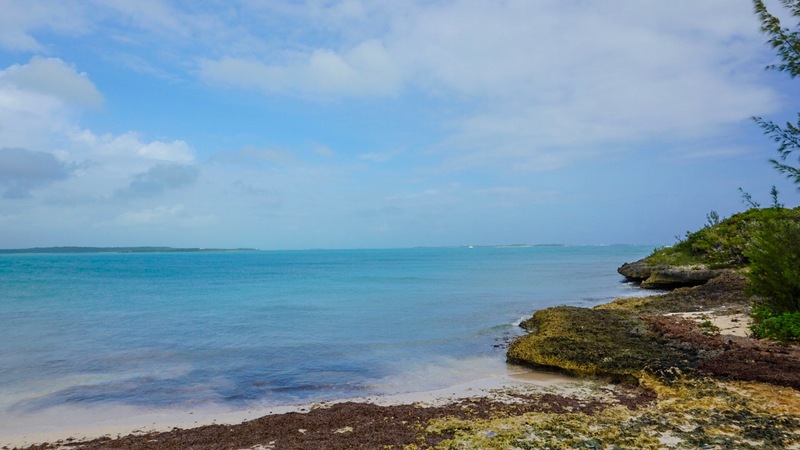 After a few wonderful days spent in Little Harbour we could see the weather window we were waiting for to make our crossing to Eleuthera. We’d had a lovely time. Great dinners at the pub, too many cocktails at the pub, a fascinating tour of the foundry, but there was one thing we still wanted to do—go fishing with our friend Charlie Sweeting! We met Charlie our first night in Little Harbour. He is an island native who has lived here all his life. 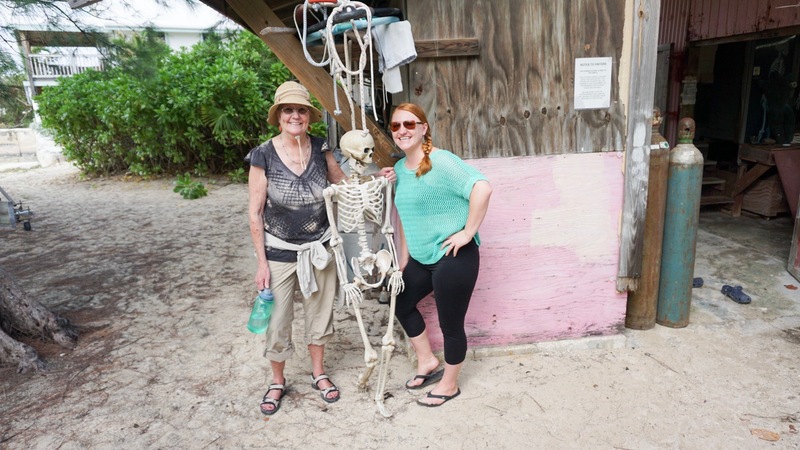 The Sweetings are actually one of the oldest families on Man-O-War Cay, but Charlie has spent the last decade or so of his life right here in Little Harbour. He lives on a boat with his dog Poppet and the pair go fishing every day. 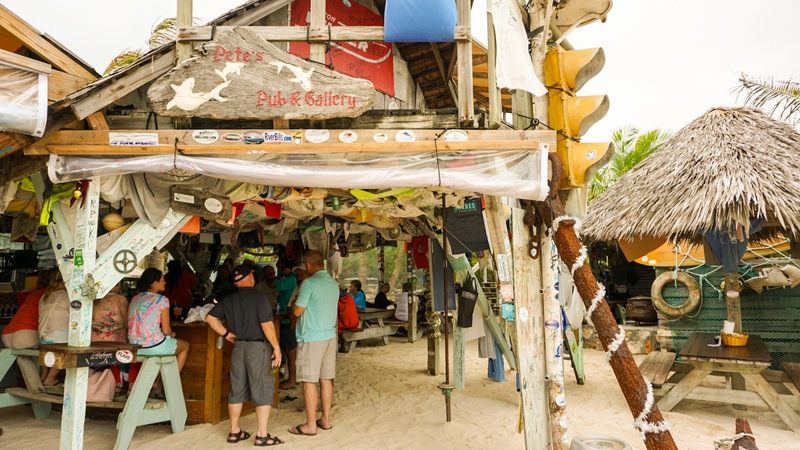 Charlie isn’t really a commercial fisherman, more of a lifelong hobbyist, but he usually catches enough conch to make a batch of conch salad big enough to share with everyone at Pete’s Pub. He’s a regular at the pub and likes to bring flowers for all the ladies to wear in their hair. So sweet! About the same age as my parents, they found they had a lot in common and became fast friends. Charlie had invited us to go out fishing a few days before but with the rainy weather the right time had never materialized. So we were super excited when Charlie showed up on our last day and asked us to hop on board! 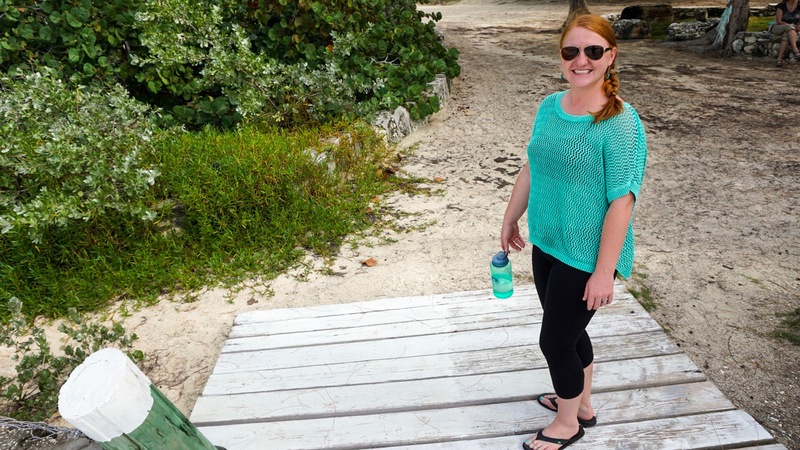 The Abacos are full of fascinating wild creatures, but there was one inhabitant of the islands that I wanted to see more than any other—a manatee! 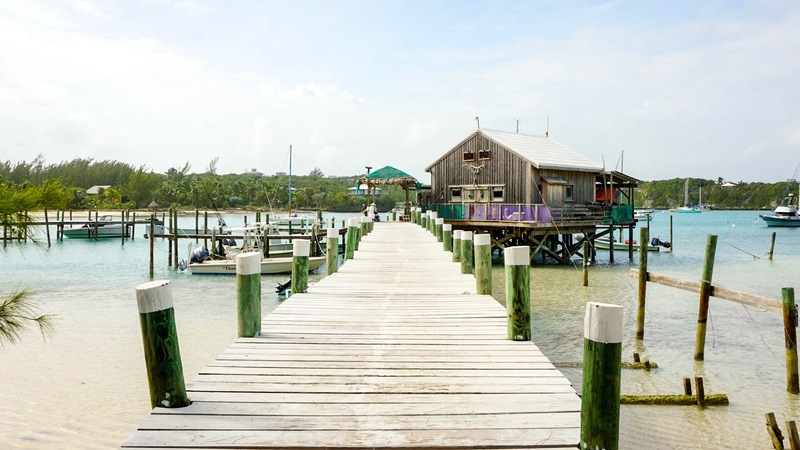 There are only a handful of manatees living in the Abacos. These are really Florida manatees who have migrated across the gulf stream and made a new life in the Bahamas. They may have washed over during a hurricane or ended up here out of desperation due to habitat loss in Florida. Or maybe these are just really adventurous manatees! 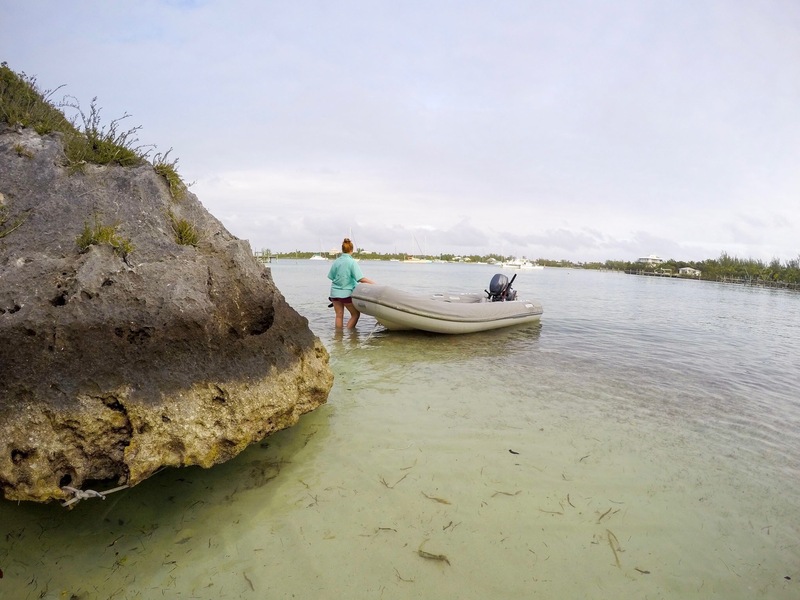 Thankfully, the locals love and protect their small manatee population and they seem to be doing well in their new Bahamian home. They are even breeding so there is hope for an increase in their numbers! We had heard rumors of a manatee living in Little Harbour so I had a decent idea when I saw a group of women looking over the edge of the dock oohing and awwwing like they had found a lost puppy. 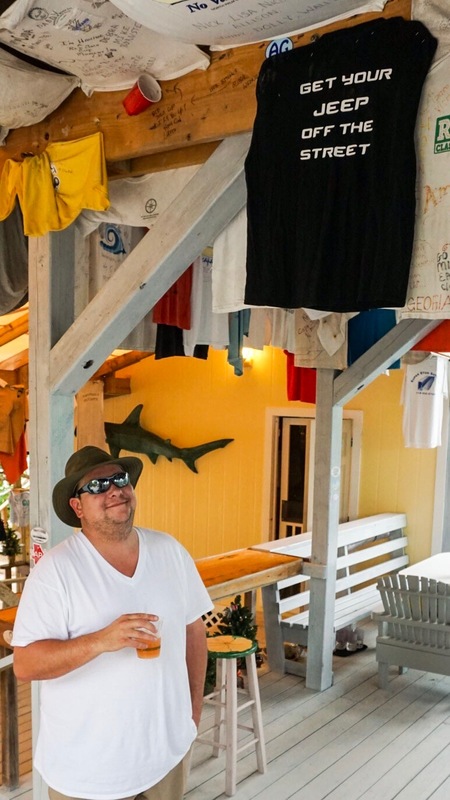 This was just after a rain storm and the manatee was drinking the fresh water running off the roof of Pete’s Yacht Club. Although manatees live in saltwater they can only drink fresh water. This is one of the reasons they live in shallow water where freshwater can be found running into the ocean. 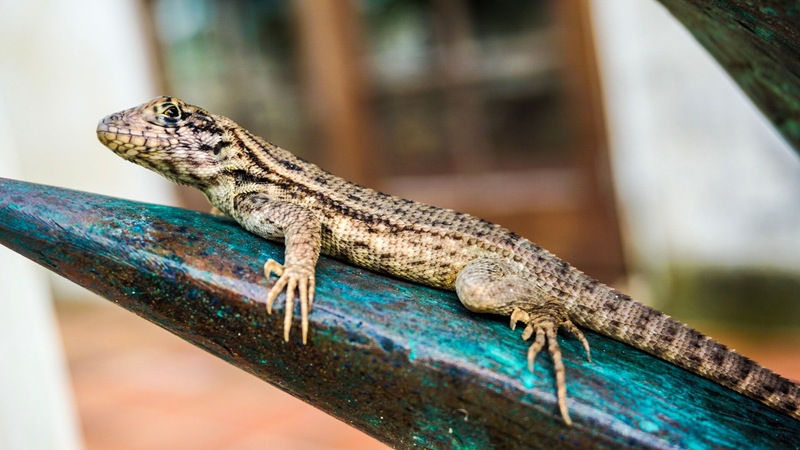 They also eat grasses and other leafy things that grow in the shallow water. 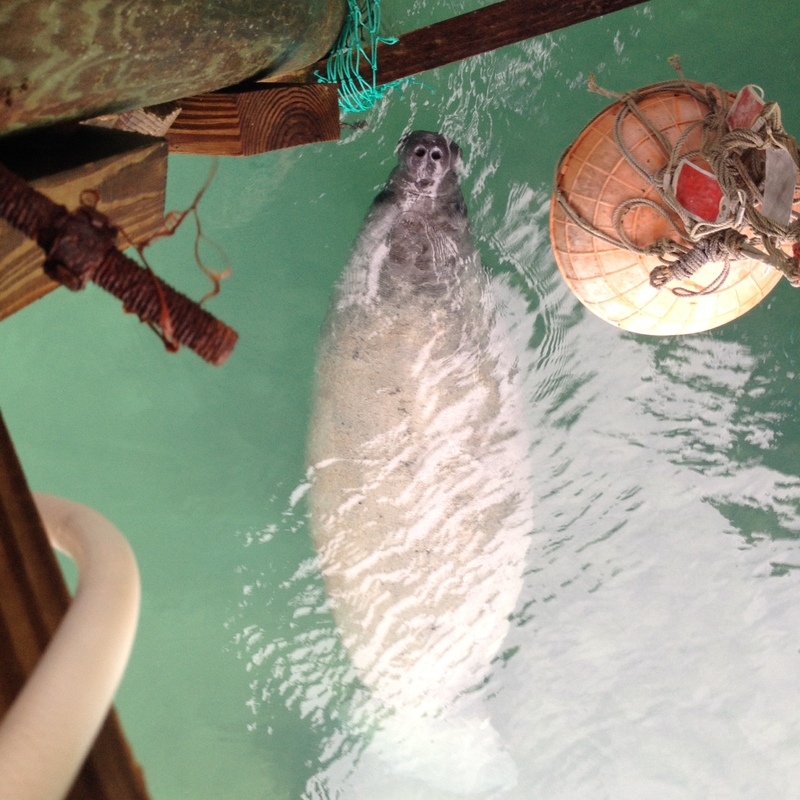 This particular manatee was likely either Randy or Georgie, both of which have been spotted hanging around Pete’s Pub this winter. If you see a manatee in the wild: please don’t feed it, touch it, chase it, follow it, or give it water. They don’t need our help to find food and water. Just like a stray cat, feeding and watering the manatees just encourages them to rely on people and hang around harbours with lots of boat traffic. Boat motors pose a big problem for manatees. They swim close to the surface and are difficult to see! If you see a manatee while in your boat, slow down, shut off the motor and wait for the manatee to travel a safe distance from your boat before continuing. If you would like to see more of the local Bahamian manatee population and track their locations, follow the Bahamas Manatee Club on Facebook. To learn more about manatee conservation in the states, check out www.savethemanatee.org. You can volunteer, donate, and even “adopt” a manatee of your very own. Great post! I am so impressed with your description of the foundry tour. Great job of editing the “Fising with Charlie” video. 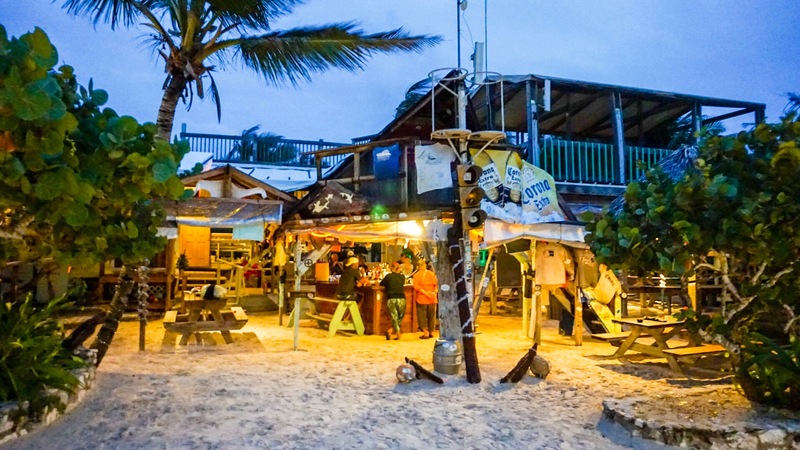 We DID have a great time spending five whole days at Little Harbour, one of my favorite watering holes. Thanks! Brandon and I remembered the general process Desmond described, but I had to do some research to fill in the details.